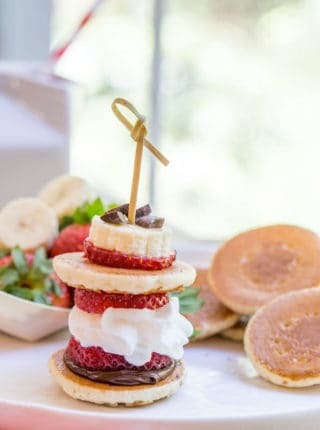 Mini Pancakes, sometimes called Silver Dollar are the easiest quickest little pancake bites that are perfect for parties, brunches, kids and pancake kabobs! Mini Pancakes are becoming a more and more frequent part of our breakfasts in the house. 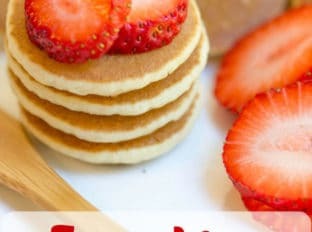 With toddlers and the ease of eating them instead of having to cut into a stack of larger pancakes we are all completely in love! 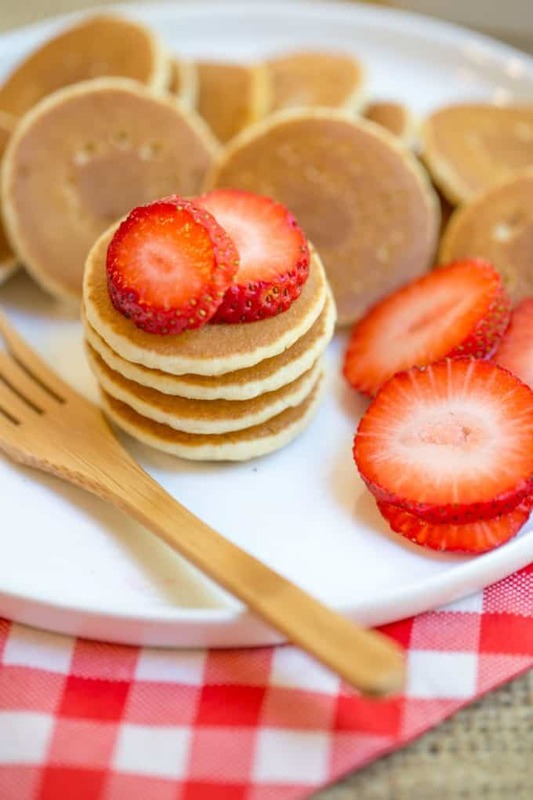 We make these Mini Pancakes in every flavor so if you’re looking for some other flavored pancakes make some Cinnamon Roll Pancakes, or Cornmeal Bacon Pancakes or Gingerbread Pancakes with Cinnamon Syrup. Use a griddle if at all possible, either on your stovetop on low heat or an electric griddle. I keep my electric griddle in my kitchen JUST for this recipe and I always get PERFECT browning. 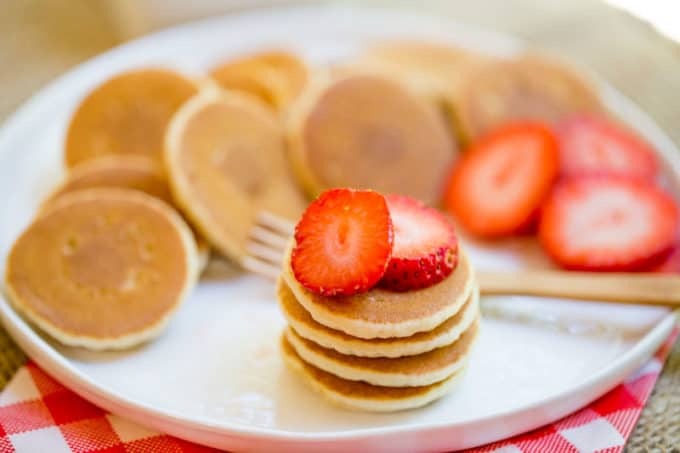 Use a tablespoon measure to make the pancakes in an even size. Now, the important part… you know how you can pour the pancake batter out of a measuring cup and there is a thick layer behind? Don’t scoop that out, a quick way to get the right amount (3/4 tablespoon) is to just leave that little bit behind. Don’t use a fork to flip the pancakes. Use a small little spatula to flip. The fork may cause the flipping to take longer or may get batter on the fork. 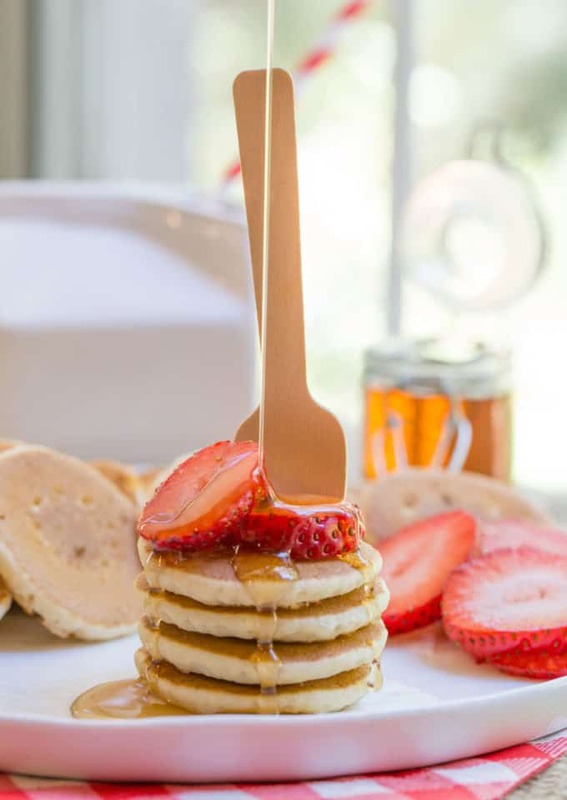 The curved nature of the fork isn’t great for these little pancakes. Use ADORABLE serveware like these cute little bamboo forks that Nature’s Party sent me (no sponsorship here, I just got an adorable sample)! 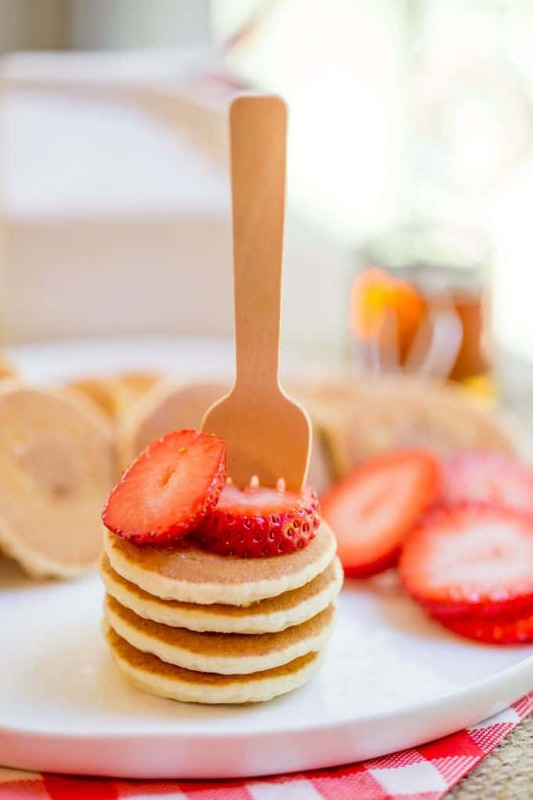 They make a perfect disposable party fork too and come on look at the adorable stack made with that fork. 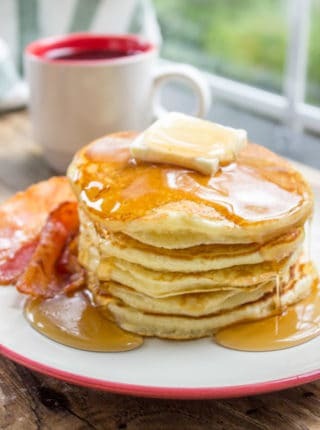 Serve dry to guests or even serve with some maple syrup drizzled over the stack for the easiest brunch bites ever! Chocolate Chips – Any flavor of Chocolate chips you want or even a mix of them. Time to use up the remnants at the bottom of your bags! 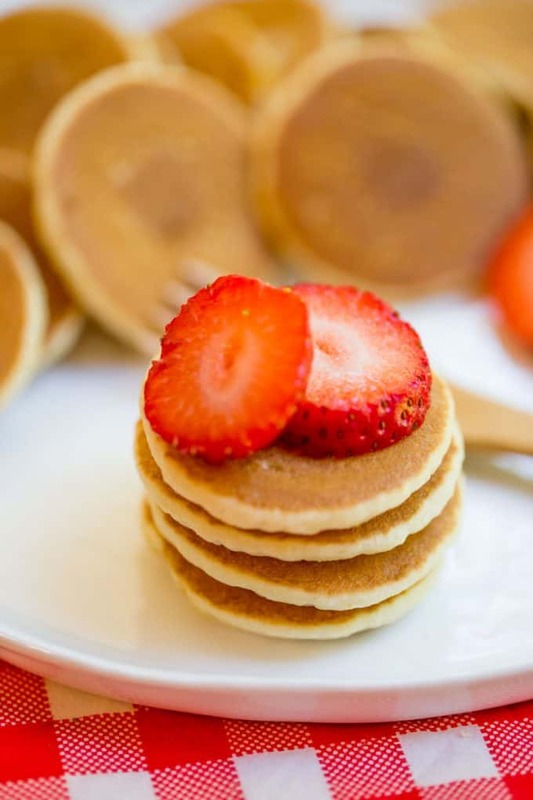 Peanut Butter – Add a couple of tablespoons of peanut butter to the batter, then add fruit or fruit jelly to the top. Take it up an even further notch and add chopped peanuts on top. Nutella – Because, well, Nutella makes everything better. I stack with strawberries and Nutella because it makes the best kabobs… EVER. You can add the dry ingredients and whisk together, then add the wet and combine fully. I tend to just put everything in a bowl and whisk, these pancakes are really fuss free. Heat a pan or griddle on medium-low heat and coat with a small layer of butter. Using a tablespoon measure use about 3/4 of a tablespoon of batter (just scoop with the tablespoon measure but don't scrape out the entire amount, a quick pour will leave enough behind). 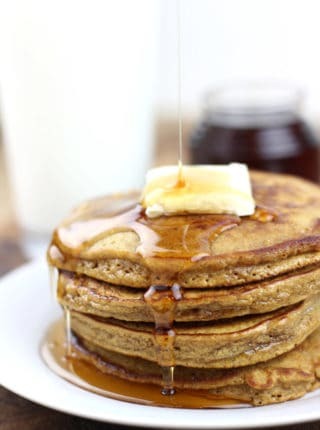 Cook the pancakes on both sides until lightly browned, about 45 seconds on each side. Enjoy with your favorite toppings or mix-ins. My husband and I had a brunch reception for our wedding and one of the hors d’oeuvres were mini pancakes with sugared blueberries and mint. Totally fun! Adorable! I don’t have any, but I can totally imagine how useful and convenient silver dollars for toddlers, great idea. I do love those bamboo forks too! These look adorable! 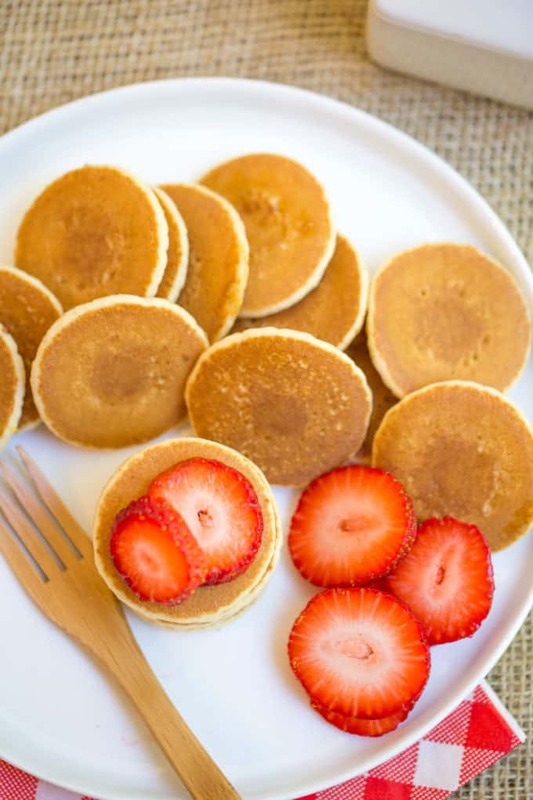 I’m going to serve mini lemon ricotta pancakes for a baby shower soon and these cute pics have got me so excited to make them! My kids would love these! So cute and perfect for little hands.